The Cuckoo Trail01273 481637work Nature TrailThe Cuckoo Trail is owned by Wealden District Council & East Sussex County Council but this ‘cycle/pathway’ was not originally built for this purpose. Opened in 1880, the Cuckoo Line was the Polegate to Eridge railway, carrying milk, livestock and animal feed as well as passengers. It was named the Cuckoo Line after the tradition that the first cuckoo of spring was heard at Heathfield Fair. Although it was a busy line it eventually closed due to the cuts made by Dr Beeching in 1968. 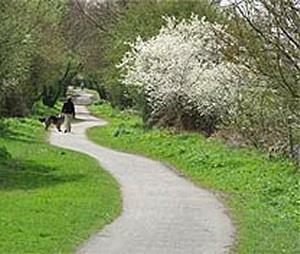 The Cuckoo Trail is owned by Wealden District Council & East Sussex County Council but this ‘cycle/pathway’ was not originally built for this purpose. Opened in 1880, the Cuckoo Line was the Polegate to Eridge railway, carrying milk, livestock and animal feed as well as passengers. It was named the Cuckoo Line after the tradition that the first cuckoo of spring was heard at Heathfield Fair. Although it was a busy line it eventually closed due to the cuts made by Dr Beeching in 1968.